Harley, 1976-2002. 8 vols, col plates, maps, text figs. . PB. 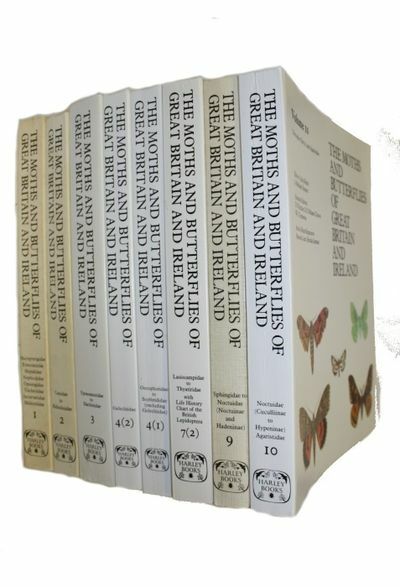 Vg set (3 spines slightly darkened).. All volumes on moths published to date in this standard set on British & Irish Lepidoptera: 1: Micropterigidae - Heliozelidae; 2: Cossidae - Heliodinidae; 3: Yponomeutidae - Elachistidae; 4: Oecophoridae - Scythrididae & Gelechiidae; 7: Lasiocampidae - Thyatiridae; 9: Sphingidae - Noctuidae; 10: Noctuidae - Agaristidae. Not including the butterfly volume.